When my readers ask, I respond. The most recent reader mailbag question comes from Reader Lauren. “You should consider writing about gifts to give co-workers. Specifically if you are participating in a 12 days of Christmas exchange where you need to give a small gift each day. It’s hard to think of many $1-$4 gifts per day. Like I said – readers ask, I respond. Here are a few ideas all under $5. 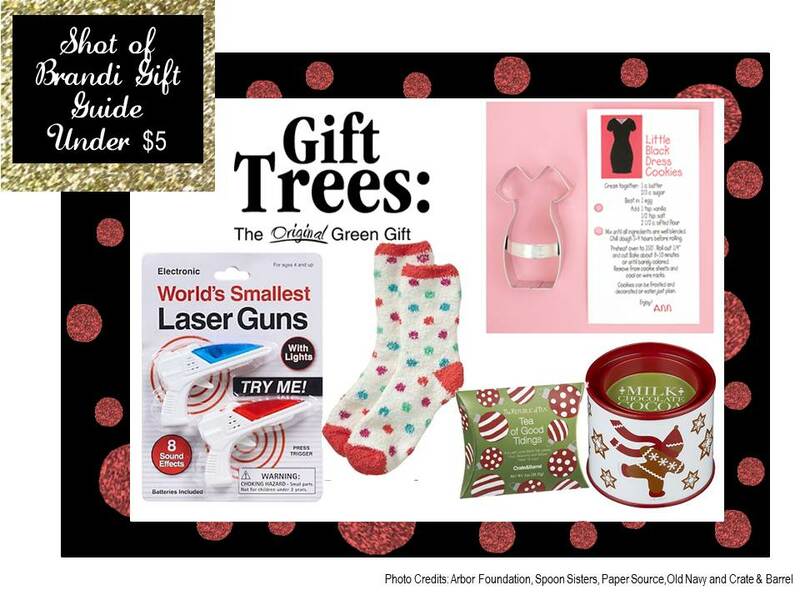 · A Tree: The Arbor Day Foundation sells gift trees for $3. Choose between Redwoods, Pines or Spruces! · Cookie Cutters: If she/he is a baker, some cute cookie cutters would be nice! · Obvi gift cards for things like coffee, bagels, iTunes can work under $5. · Mini Laser Guns: Why? Why not? Haven't you ever wanted to "shoot" your co-worker? These guns make it safe. And there are two. You can duel. · Don’t underestimate the power of the Dollar Store. They have some cute wine glasses, kitchen goods, etc. · Cozy Socks from Old Navy: These are seriously my go-two ALL WINTER LONG. And maybe in the summer. And maybe during car rides. Whatever. They are awesome and only $2.50! · Tea or Hot Chocolate: Check out Crate & Barrel for cutesy-wrapped items under $5.